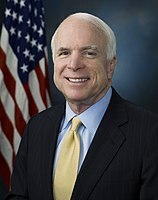 John Sidney McCain III (born August 29, 1936) is an American politician who currently serves as the senior United States Senator from Arizona, in that office since 1987. He was the Republican nominee for President of the United States in the 2008 election, which he lost to Barack Obama. McCain followed his father and grandfather, both four-star admirals, into the United States Navy and graduated from the U.S. Naval Academy in 1958. He became a naval aviator and flew ground-attack aircraft from aircraft carriers. During the Vietnam War, he was almost killed in the 1967 USS Forrestal fire. While McCain was on a bombing mission over Hanoi in October 1967, he was shot down, seriously injured, and captured by the North Vietnamese. He was a prisoner of war until 1973. McCain experienced episodes of torture and refused an out-of-sequence early repatriation offer. The wounds that he sustained during war have left him with lifelong physical disabilities. While generally adhering to conservative principles, McCain at times has had a media reputation as a “maverick” for his willingness to disagree with his party on certain issues. After being investigated and largely exonerated in a political influence scandal of the 1980s as a member of the Keating Five, he made campaign finance reform one of his signature concerns, which eventually resulted in passage of the McCainFeingold Act in 2002. He is also known for his work in the 1990s to restore diplomatic relations with Vietnam, and for his belief that the Iraq War should have been fought to a successful conclusion. 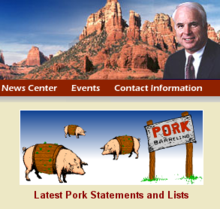 McCain has chaired the Senate Commerce Committee, and he opposed pork barrel spending. He was a member of the bi-partisan group known as the Gang of 14 who played a key role in alleviating a crisis over judicial nominations. McCain entered the race for the Republican nomination for President in 2000, but he lost a heated primary season contest to George W. Bush of Texas. He secured the nomination in 2008 after coming back from early reversals, but was defeated by Democratic nominee Barack Obama in the general election, losing by a 365173 electoral college margin. He subsequently adopted more orthodox conservative stances and attitudes and largely opposed actions of the Obama administration, especially in regard to foreign policy matters. By 2013, however, he had become a key figure in the Senate for negotiating deals on certain issues in an otherwise partisan environment. In 2015, McCain became chairman of the Senate Armed Services Committee. McCain announced his candidacy for president on September 27, 1999, in Nashua, New Hampshire, saying he was staging “a fight to take our government back from the power brokers and special interests, and return it to the people and the noble cause of freedom it was created to serve”. The frontrunner for the Republican nomination was Texas Governor George W. Bush, who had the political and financial support of most of the party establishment. The Arizona Republic would write that the McCainBush primary contest in South Carolina “has entered national political lore as a low-water mark in presidential campaigns”, while The New York Times called it “a painful symbol of the brutality of American politics”. A variety of interest groups that McCain had challenged in the past ran negative ads. Bush borrowed McCain’s earlier language of reform, and declined to dissociate himself from a veterans activist who accused McCain (in Bush’s presence) of having “abandoned the veterans” on POW/MIA and Agent Orange issues. McCain lost South Carolina on February 19, with 42 percent of the vote to Bush’s 53 percent, in part because Bush mobilized the state’s evangelical voters and outspent McCain. The win allowed Bush to regain lost momentum. McCain would say of the rumor spreaders, “I believe that there is a special place in hell for people like those.” According to one report, the South Carolina experience left McCain in a “very dark place”. McCain began 2001 by breaking with the new George W. Bush administration on a number of matters, including HMO reform, climate change, and gun legislation; McCainFeingold was opposed by Bush as well. In May 2001, McCain was one of only two Senate Republicans to vote against the Bush tax cuts. Besides the differences with Bush on ideological grounds, there was considerable antagonism between the two remaining from the previous year’s campaign. Later, when a Republican senator, Jim Jeffords, became an Independent, thereby throwing control of the Senate to the Democrats, McCain defended Jeffords against “self-appointed enforcers of party loyalty”. Indeed, there was speculation at the time, and in years since, about McCain himself leaving the Republican Party, but McCain has always adamantly denied that he ever considered doing so. Beginning in 2001, McCain used political capital gained from his presidential run, as well as improved legislative skills and relationships with other members, to become one of the Senate’s most influential members. In March 2002, McCainFeingold, officially known as the Bipartisan Campaign Reform Act of 2002, passed in both Houses of Congress and was signed into law by President Bush. Seven years in the making, it was McCain’s greatest legislative achievement. In the 2004 U.S. presidential election campaign, McCain was once again frequently mentioned for the vice-presidential slot, only this time as part of the Democratic ticket under nominee John Kerry. McCain said that Kerry had never formally offered him the position and that he would not have accepted it if he had. 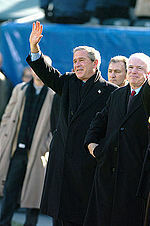 At the 2004 Republican National Convention, McCain supported Bush for re-election, praising Bush’s management of the War on Terror since the September 11 attacks. At the same time, he defended Kerry’s Vietnam War record. By August 2004, McCain had the best favorable-to-unfavorable rating (55 percent to 19 percent) of any national politician; he campaigned for Bush much more than he had four years previously, though the two remained situational allies rather than friends. Breaking from his 2001 and 2003 votes, McCain supported the Bush tax cut extension in May 2006, saying not to do so would amount to a tax increase. Working with Democratic Senator Ted Kennedy, McCain was a strong proponent of comprehensive immigration reform, which would involve legalization, guest worker programs, and border enforcement components. The Secure America and Orderly Immigration Act was never voted on in 2005, while the Comprehensive Immigration Reform Act of 2006 passed the Senate in May 2006 but failed in the House. In June 2007, President Bush, McCain, and others made the strongest push yet for such a bill, the Comprehensive Immigration Reform Act of 2007, but it aroused intense grassroots opposition among talk radio listeners and others, some of whom furiously characterized the proposal as an “amnesty” program, and the bill twice failed to gain cloture in the Senate. By the middle of the 2000s (decade), the increased Indian gaming that McCain had helped bring about was a $23 billion industry. He was twice chairman of the Senate Indian Affairs Committee, in 19951997 and 20052007, and his Committee helped expose the Jack Abramoff Indian lobbying scandal. By 2005 and 2006, McCain was pushing for amendments to the Indian Gaming Regulatory Act that would limit creation of off-reservation casinos, as well as limiting the movement of tribes across state lines to build casinos. Meanwhile, McCain continued questioning the progress of the war in Iraq. In September 2005, he remarked upon Chairman of the Joint Chiefs of Staff Richard Myers‘ optimistic outlook on the war’s progress: “Things have not gone as well as we had planned or expected, nor as we were told by you, General Myers.” In August 2006, he criticized the administration for continually understating the effectiveness of the insurgency: “We not told the American people how tough and difficult this could be.” From the beginning, McCain strongly supported the Iraq troop surge of 2007. The strategy’s opponents labeled it “McCain’s plan” and University of Virginia political science professor Larry Sabato said, “McCain owns Iraq just as much as Bush does now.” The surge and the war were unpopular during most of the year, even within the Republican Party, as McCain’s presidential campaign was underway; faced with the consequences, McCain frequently responded, “I would much rather lose a campaign than a war.” In March 2008, McCain credited the surge strategy with reducing violence in Iraq, as he made his eighth trip to that country since the war began. McCain’s oft-cited strengths as a presidential candidate for 2008 included national name recognition, sponsorship of major lobbying and campaign finance reform initiatives, his ability to reach across the aisle, his well-known military service and experience as a POW, his experience from the 2000 presidential campaign, and an expectation that he would capture Bush’s top fundraisers. During the 2006 election cycle, McCain had attended 346 events and helped raise more than $10.5 million on behalf of Republican candidates. McCain also became more willing to ask business and industry for campaign contributions, while maintaining that such contributions would not affect any official decisions he would make. Despite being considered the front-runner for the nomination by pundits as 2007 began, McCain was in second place behind former Mayor of New York City Rudy Giuliani in national Republican polls as the year progressed. The Arizona senator subsequently resumed his familiar position as a political underdog, riding the Straight Talk Express and taking advantage of free media such as debates and sponsored events. By December 2007, the Republican race was unsettled, with none of the top-tier candidates dominating the race and all of them possessing major vulnerabilities with different elements of the Republican base electorate. 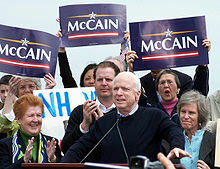 McCain was showing a resurgence, in particular with renewed strength in New Hampshire  the scene of his 2000 triumph  and was bolstered further by the endorsements of The Boston Globe, the New Hampshire Union Leader, and almost two dozen other state newspapers, as well as from Senator Lieberman (now an Independent Democrat). McCain decided not to campaign significantly in the January 3, 2008, Iowa caucuses, which saw a win by former Governor of Arkansas Mike Huckabee. McCain was born in the Panama Canal Zone. Had he been elected, he would have become the first president who was born outside the contiguous forty-eight states. This raised a potential legal issue, since the United States Constitution requires the president to be a natural-born citizen of the United States. A bipartisan legal review, and a unanimous but non-binding Senate resolution, both concluded that he is a natural-born citizen. Also, if inaugurated in 2009 at age 72 years and 144 days, he would have been the oldest U.S. president upon ascension to the presidency, and the second-oldest president to be inaugurated. McCain clinched enough delegates for the nomination and his focus shifted toward the general election, while Barack Obama and Hillary Clinton fought a prolonged battle for the Democratic nomination. McCain introduced various policy proposals, and sought to improve his fundraising. Cindy McCain, who accounts for most of the couple’s wealth with an estimated net worth of $100 million, made part of her tax returns public in May. After facing criticism about lobbyists on staff, the McCain campaign issued new rules in May 2008 to avoid conflicts of interest, causing five top aides to leave. When Obama became the Democrats’ presumptive nominee in early June, McCain proposed joint town hall meetings, but Obama instead requested more traditional debates for the fall. In July, a staff shake-up put Steve Schmidt in full operational control of the McCain campaign. Throughout these summer months, Obama typically led McCain in national polls by single-digit margins, and also led in several key swing states. McCain reprised his familiar underdog role, which was due at least in part to the overall challenges Republicans faced in the election year. McCain accepted public financing for the general election campaign, and the restrictions that go with it, while criticizing his Democratic opponent for becoming the first major party candidate to opt out of such financing for the general election since the system was implemented in 1976. The Republican’s broad campaign theme focused on his experience and ability to lead, compared to Obama’s. 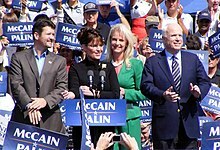 On August 29, 2008, McCain revealed Alaska Governor Sarah Palin as his surprise choice for running mate. McCain was only the second U.S. major-party presidential nominee (after Walter Mondale) to select a woman for his running mate and the first Republican to do so; Palin would have become the first female Vice President of the United States if McCain had been elected. On September 3, 2008, McCain and Palin became the Republican Party’s presidential and vice presidential nominees, respectively, at the 2008 Republican National Convention in Saint Paul, Minnesota. McCain surged ahead of Obama in national polls following the convention, as the Palin pick energized core Republican voters who had previously been wary of him. However, by the campaign’s own later admission, the rollout of Palin to the national media went poorly, and voter reactions to Palin grew increasingly negative, especially among independents and other voters concerned about her qualifications. On September 24, McCain said he was temporarily suspending his campaign activities, called on Obama to join him, and proposed delaying the first of the general election debates with Obama, in order to work on the proposed U.S. financial system bailout before Congress, which was targeted at addressing the subprime mortgage crisis and liquidity crisis. McCain’s intervention helped to give dissatisfied House Republicans an opportunity to propose changes to the plan that was otherwise close to agreement. After Obama declined McCain’s suspension suggestion, McCain went ahead with the debate on September 26. On October 1, McCain voted in favor of a revised $700 billion rescue plan. Another debate was held on October 7; like the first one, polls afterward suggested that Obama had won it. A final presidential debate occurred on October 15. During and after the final debate, McCain compared Obama’s proposed policies to socialism and often invoked “Joe the Plumber” as a symbol of American small business dreams that would be thwarted by an Obama presidency. McCain barred using the Jeremiah Wright controversy in ads against Obama, but the campaign did frequently criticize Obama regarding his purported relationship with Bill Ayers. McCain’s rallies became increasingly vitriolic, with attendees denigrating Obama and displaying a growing anti-Muslim and anti-African-American sentiment. After one female McCain supporter said she did not trust Obama because “he’s an Arab”, McCain pointedly replied to the woman, “No ma’am. He’s a decent family man, citizen, that I just happen to have disagreements with on fundamental issues.” McCain’s response was considered one of the finer moments of the campaign and was still being viewed several years later as a marker for civility in American politics. Down the stretch, McCain was outspent by Obama by a four-to-one margin. The election took place on November 4, and Barack Obama was projected the winner at about 11:00 pm Eastern Standard Time; McCain delivered his concession speech in Phoenix, Arizona about twenty minutes later. In it, he noted the historic and special significance of Obama becoming the nation’s first African American president. In the end, McCain won 173 electoral college votes to Obama’s 365; McCain failed to win most of the battleground states and lost some traditionally Republican ones. McCain gained 46 percent of the nationwide popular vote, compared to Obama’s 53 percent. Nevertheless, McCain emerged as a leader of the Republican opposition to the Obama economic stimulus package of 2009, saying it had too much spending for too little stimulative effect. McCain also voted against Obama’s Supreme Court nomination of Sonia Sotomayor  saying that while undeniably qualified, “I do not believe that she shares my belief in judicial restraint”  and by August 2009 was siding more often with his Republican Party on closely divided votes than ever before in his senatorial career. McCain reasserted that the War in Afghanistan was winnable and criticized Obama for a slow process in deciding whether to send additional U.S. troops there. In early 2010, a primary challenge from radio talk show host and former U.S. Congressman J. D. Hayworth materialized in the 2010 U.S. Senate election in Arizona and drew support from some but not all elements of the Tea Party movement. 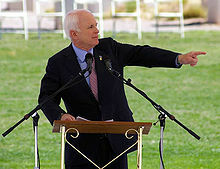 With Hayworth using the campaign slogan “The Consistent Conservative”, McCain said  despite his own past use of the term on a number of occasions  “I never considered myself a maverick. I consider myself a person who serves the people of Arizona to the best of his abilities.” The primary challenge coincided with McCain reversing or muting his stance on some issues such as the bank bailouts, closing of the Guantánamo Bay detention facility, campaign finance restrictions, and gays in the military. When the health care plan, now called the Patient Protection and Affordable Care Act, passed Congress and became law in March 2010, McCain strongly opposed the landmark legislation not only on its merits but also on the way it had been handled in Congress. As a consequence, he warned that congressional Republicans would not be working with Democrats on anything else: “There will be no cooperation for the rest of the year. They have poisoned the well in what they’ve done and how they’ve done it.” McCain became a vocal defender of Arizona SB 1070, the April 2010 tough anti-illegal immigration state law that aroused national controversy, saying that the state had been forced to take action given the federal government’s inability to control the border. In the August 24 primary, McCain beat Hayworth by a 56 to 32 percent margin. McCain proceeded to easily defeat Democratic city councilman Rodney Glassman in the general election. In the lame duck session of the 111th Congress, McCain voted for the compromise Tax Relief, Unemployment Insurance Reauthorization, and Job Creation Act of 2010, but against the DREAM Act (which he had once sponsored) and the New START Treaty. Most prominently, he continued to lead the eventually losing fight against “Don’t ask, don’t tell” repeal. In his opposition, he sometimes fell into anger or hostility on the Senate floor, and called its passage “a very sad day” that would compromise the battle effectiveness of the military. While control of the House of Representatives went over to the Republicans in the 112th Congress, the Senate stayed Democratic and McCain continued to be the ranking member of the Senate Armed Services Committee. As the Arab Spring took center stage, McCain urged that the embattled Egyptian president, Hosni Mubarak, step down and thought the U.S. should push for democratic reforms in the region despite the associated risks of religious extremists gaining power. McCain was an especially vocal supporter of the 2011 military intervention in Libya. In April of that year he visited the Anti-Gaddafi forces and National Transitional Council in Benghazi, the highest-ranking American to do so, and said that the rebel forces were “my heroes”. In June, he joined with Senator Kerry in offering a resolution that would have authorized the military intervention, and said: “The administration’s disregard for the elected representatives of the American people on this matter has been troubling and counterproductive.” In August, McCain voted for the Budget Control Act of 2011 that resolved the U.S. debt ceiling crisis. In November, McCain and Senator Carl Levin were leaders in efforts to codify in the National Defense Authorization Act for Fiscal Year 2012 that terrorism suspects, no matter where captured, could be detained by the U.S. military and its tribunal system; following objections by civil libertarians, some Democrats, and the White House, McCain and Levin agreed to language making it clear that the bill would not pertain to U.S. citizens. In the 2012 Republican Party presidential primaries, McCain endorsed former 2008 rival Mitt Romney and campaigned for him, but compared the contest to a Greek tragedy due to its drawn-out nature with massive super PAC-funded attack ads damaging all the contenders. He labeled the Supreme Court’s 2010 Citizens United v. Federal Election Commission decision as “uninformed, arrogant, naïve”, and, decrying its effects and the future scandals he thought it would bring, said it would become considered the court’s “worst decision … in the 21st century”. McCain took the lead in opposing the defense spending sequestrations brought on by the Budget Control Act of 2011 and gained attention for defending State Department aide Huma Abedin against charges brought by a few House Republicans that she had ties to the Muslim Brotherhood. 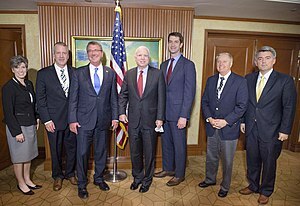 During 2013, McCain was a member of a bi-partisan group of senators, the “Gang of Eight“, which announced principles for another try at comprehensive immigration reform. The resulting Border Security, Economic Opportunity, and Immigration Modernization Act of 2013 passed the Senate by a 6832 margin, but faced an uncertain future in the House. In July 2013, McCain was at the forefront of an agreement among senators to drop filibusters against Obama administration executive nominees without Democrats resorting to the “nuclear option” that would disallow such filibusters altogether. However, the option would be imposed later in the year anyway, much to the senator’s displeasure. These developments and some other negotiations showed that McCain now had improved relations with the Obama administration, including the president himself, as well as with Democratic Senate Majority Leader Harry Reid, and that he had become the leader of a power center in the Senate for cutting deals in an otherwise bitterly partisan environment. They also led some observers to conclude that the “maverick” McCain had returned. McCain was a supporter of the Euromaidan protests against the elected Ukrainian President Viktor Yanukovych and his government, and appeared in Independence Square in Kiev in December 2013. Following the overthrow of Yanukovych and subsequent 2014 Russian military intervention in Ukraine, McCain became a vocal supporter of providing arms to Ukrainian military forces, saying the sanctions imposed against Russia were not enough. In 2014, McCain led the opposition to the appointments of Colleen Bell, Noah Mamet, and George Tsunis to the ambassadorships in Hungary, Argentina, and Norway, respectively, arguing they were unqualified appointees being rewarded for their political fundraising. Unlike many Republicans, McCain supported the release and contents of the Senate Intelligence Committee report on CIA torture in December 2014, saying “The truth is sometimes a hard pill to swallow. It sometimes causes us difficulties at home and abroad. It is sometimes used by our enemies in attempts to hurt us. But the American people are entitled to it, nonetheless.” He added that the CIA’s practices following the September 11 attacks had “stained our national honor” while doing “much harm and little practical good” and that “Our enemies act without conscience. We must not.” He opposed the Obama administration’s December 2014 decision to normalize relations with Cuba. During the 2016 Republican primaries, McCain said he would support the Republican nominee even if it was Donald Trump, but following Mitt Romney’s March 3 speech, McCain endorsed the sentiments expressed in that speech, saying he had serious concerns about Trump’s “uninformed and indeed dangerous statements on national security issues”. Relations between the two had been fraught since early in the Donald Trump presidential campaign, 2016, when McCain referred to a room full of Trump supporters as “crazies”, and the real estate mogul then said of McCain: “He insulted me, and he insulted everyone in that room… He is a war hero because he was captured. I like people who weren’t captured… perhaps he was a war hero, but right now he’s said a lot of very bad things about a lot of people.” Following Trump becoming the presumptive nominee of the party on May 3, McCain said that Republican voters had spoken and he would support Trump. McCain himself faced a primary challenge from Kelli Ward, a fervent Trump supporter, and then was expected to face a potentially strong challenge from Democratic Congresswoman Ann Kirkpatrick in the general election. The senator privately expressed worry over the effect that Trump’s unpopularity among Hispanic voters might have on his own chances but also was concerned with losing pro-Trump white voters; he thus kept his endorsement of Trump in place but tried to speak of him as little as possible given their disagreements. However McCain defeated Ward in the primary by a double-digit percentage point margin and gained a similar lead over Kirkpatrick in general election polls, and when the Donald Trump Access Hollywood controversy broke, he felt secure enough to on October 8 withdraw his endorsement of Trump. McCain stated that Trump’s “demeaning comments about women and his boasts about sexual assaults” made it “impossible to continue to offer even conditional support” and added that he would not vote for Hillary Clinton, but would instead “write in the name of some good conservative Republican who is qualified to be president.” McCain, now 80 years of age, went on to defeat Kirkpatrick, securing a sixth term as United States States Senator from Arizona. Repeal and replacement of Obamacare (the Patient Protection and Affordable Care Act) was a centerpiece of McCain’s 2016 re-election campaign, and in July 2017 he said, “Have no doubt: Congress must replace Obamacare, which has hit Arizonans with some of the highest premium increases in the nation and left 14 of Arizonas 15 counties with only one provider option on the exchanges this year.” He added that he supports affordable and quality health care, but objected that the pending Senate bill did not do enough to shield the Medicaid system in Arizona. President Trump made a public statement wishing Senator McCain well, as did many others, including former President Obama. On July 19, McCain’s senatorial office issued a statement that he “appreciates the outpouring of support he has received over the last few days. He is in good spirits as he continues to recover at home with his family in Arizona. He is grateful to the doctors and staff at Mayo Clinic for their outstanding care, and is confident that any future treatment will be effective.” On July 24, McCain announced via Twitter that he would return to the United States Senate the following day. 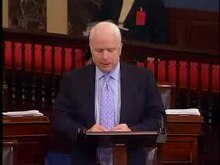 On July 25, 2017, less than two weeks after brain surgery, McCain returned to the Senate, and cast a deciding vote allowing the Senate to begin consideration of bills to replace Obamacare. Along with that vote, he delivered a speech criticizing the party-line voting process used by the Republicans, as well as by the Democrats in passing Obamacare to begin with, and McCain also urged a “return to regular order” utilizing the usual committee hearings and deliberations. On July 28, he cast the decisive vote against the Republicans’ final proposal that month, the so-called “skinny repeal” option, which failed 4951. Various advocacy groups have given McCain scores or grades as to how well his votes align with the positions of each group. The American Conservative Union has awarded McCain a lifetime rating of 82 percent through 2015, while McCain has an average lifetime 12 percent “Liberal Quotient” from Americans for Democratic Action through 2015. CrowdPac, which rates politicians based on donations made and received, has given Senator McCain a score of 4.3C with 10C being the most conservative and 10L being the most liberal. The non-partisan National Journal rates a Senator’s votes by what percentage of the Senate voted more liberally than he or she, and what percentage more conservatively, in three policy areas: economic, social, and foreign. For 20052006 (as reported in the 2008 Almanac of American Politics), McCain’s average ratings were as follows: economic policy: 59 percent conservative and 41 percent liberal; social policy: 54 percent conservative and 38 percent liberal; and foreign policy: 56 percent conservative and 43 percent liberal. In 2012, the National Journal gave McCain a composite score of 73% conservative and 27% liberal. In 2013, the National Journal gave him a composite score of 60% conservative and 40% liberal. Columnists such as Robert Robb and Matthew Continetti have used a formulation devised by William F. Buckley Jr. to describe McCain as “conservative” but not “a conservative”, meaning that while McCain usually tends towards conservative positions, he is not “anchored by the philosophical tenets of modern American conservatism.” Following his 2008 presidential election loss, McCain began adopting more orthodox conservative views; the magazine National Journal rated McCain along with seven of his colleagues as the “most conservative” Senators for 2010 and he achieved his first 100 percent rating from the American Conservative Union for that year. McCain’s personal character has been a dominant feature of his public image. This image includes the military service of both himself and his family, the circumstances and tensions surrounding the end of his first marriage and beginning of second, his maverick political persona, his temper, his admitted problem of occasional ill-considered remarks, and his close ties to his children from both his marriages. In his own estimation, the Arizona senator is straightforward and direct, but impatient. Other traits include a penchant for lucky charms, a fondness for hiking, and a sense of humor that has sometimes backfired spectacularly, as when he made a joke in 1998 about the Clintons widely deemed not fit to print in newspapers: “Do you know why Chelsea Clinton is so ugly?  Because Janet Reno is her father.” McCain subsequently apologized profusely, and the Clinton White House accepted his apology. McCain has not shied away from addressing his shortcomings, and apologizing for them. He is known for sometimes being prickly and hot-tempered with Senate colleagues, but his relations with his own Senate staff have been more cordial, and have inspired loyalty towards him. He formed a strong bond with two senators, Joe Lieberman and Lindsey Graham, over hawkish foreign policy and overseas travel, and they became dubbed the “Three Amigos”. McCain acknowledges having said intemperate things in years past, though he also says that many stories have been exaggerated. One psychoanalytic comparison suggests that McCain was not the first presidential candidate to have a temper, and cultural critic Julia Keller argues that voters want leaders who are passionate, engaged, fiery, and feisty. McCain has employed both profanity and shouting on occasion, although such incidents have become less frequent over the years. Lieberman has made this observation: “It is not the kind of anger that is a loss of control. He is a very controlled person.” Senator Thad Cochran, who has known McCain for decades and has battled him over earmarks, expressed concern about a McCain presidency: “He is erratic. He is hotheaded. He loses his temper and he worries me.” Ultimately Cochran decided to support McCain for president, after it was clear he would win the nomination. All of McCain’s family members are on good terms with him, and he has defended them against some of the negative consequences of his high-profile political lifestyle. His family’s military tradition extends to the latest generation: son John Sidney IV (“Jack”) graduated from the U.S. Naval Academy in 2009, becoming the fourth generation John S. McCain to do so, and is a helicopter pilot; son James served two tours with the Marines in the Iraq War; and son Doug flew jets in the navy. His daughter Meghan became a blogging and Twittering presence in the debate about the future of the Republican Party following the 2008 elections, and showed some of his maverick tendencies. In 1997, Time magazine named McCain as one of the “25 Most Influential People in America”. In 1999, McCain shared the Profile in Courage Award with Senator Russ Feingold for their work towards campaign finance reform. The following year, the same pair shared the Paul H. Douglas Award for Ethics in Government. In 2005, The Eisenhower Institute awarded McCain the Eisenhower Leadership Prize. The prize recognizes individuals whose lifetime accomplishments reflect Dwight D. Eisenhower‘s legacy of integrity and leadership. In 2006, the Bruce F. Vento Public Service Award was bestowed upon McCain by the National Park Trust. The same year, McCain was awarded the Henry M. Jackson Distinguished Service Award by the Jewish Institute for National Security Affairs, in honor of Senator Henry M. “Scoop” Jackson. 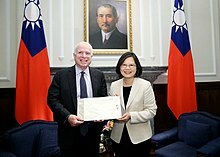 In 2007, the World Leadership Forum presented McCain with the Policymaker of the Year Award; it is given internationally to someone who has “created, inspired or strongly influenced important policy or legislation”. 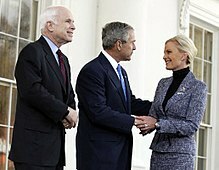 In 2010, President Mikheil Saakashvili of Georgia awarded McCain the Order of National Hero, an award never previously given to a non-Georgian. In 2015, the Kiev Patriarchate awarded McCain its own version of the Order of St. Vladimir. In 2016, Allegheny College awarded McCain, along with Vice President Joe Biden, its Prize for Civility in Public Life. In August 2016, Petro Poroshenko, the President of Ukraine, awarded McCain with the highest award for foreigners, the Order of Liberty. In April 14, 2017, Hashim Thaçi, the President of Kosovo, awarded McCain with the medal “Urdhër i Lirisë” (Order of Freedom) for his contribution to the freedom and independence of Kosovo, and its partnership with the US. McCain has received honorary degrees from colleges and universities in the United States and internationally. These include ones from Colgate University (LL.D 2000),The Citadel (DPA 2002),Wake Forest University (LL.D May 20, 2002), the University of Southern California (DHL May 2004),Northwestern University (LL.D June 17, 2005),Liberty University (2006),The New School 2006), and the Royal Military College of Canada (D.MSc June 27, 2013). He was also made an Honorary Patron of the University Philosophical Society at Trinity College Dublin in 2005.